What is it? It’s a PARASOLEIL! 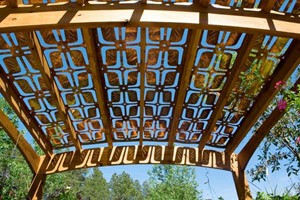 This is an amazing product that can be installed over the top of Unique’s custom pergolas for some additional shading & light distribution. It comes in many different patterns & thicknesses and can be used for multiple other applications (like privacy panels, fencing, gates, etc.) With different metals that are used, there are endless options for an incredible highly custom look! Born and made in the USA, Parasoleil stands behind the design, green certification adding toward LEED points, and structural integrity of each pattern and product for low-maintenance overhead shade panels, architectural privacy screens, ornamental metalwork gates and railings and more. 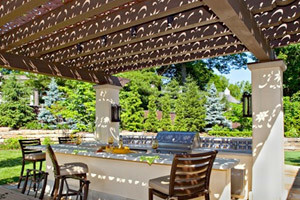 The copper and other metals that are used age beautifully and will compliment the pergola structure which it is mounted on. It is recyclable and will never rust or have to be maintained from sun damage. It is thin enough to be flexible and easily produced and installed to any application, but strong enough to withstand heavy winds. The Parasoleil design team makes sure each project is specified with the best structural support and design integrity, so that the installation is designed to last more than twenty years without maintenance. The custom perforated panels are made from powdercoated aluminum, patina aged copper, cor-ten steel, and more. Together with the “Unique” style they offer and beautiful shadows they produce, Parasoleil has caught our interest and we highly recommend them for a Unique custom shade. Adding chemical automation to your pool can take the headaches, backaches and overall mess out of keeping your pool’s water chemistry in harmony. If you are unfamiliar, chemical automation is the automatic monitoring and control of the sanitizer and pH levels in pool water. Besides automatically maintaining clean and safe water, chemical automation can help prevent harmful corrosion, scaling and bacterial growth from occurring in your pool. Automating your chemical management can also generate significant savings on the cost of chemicals, maintenance and repairs. Plus, keeping your water properly balanced and sanitized makes your pool much more inviting. Products like Pentair’s IntelliChem® Chemical Controller act as the “brain” of your pool’s chemical management and handle all of your pool’s chemical monitoring and adjustments. These type of chemical controllers automatically monitor, record and display your pool’s pH and sanitizer levels and deliver just the right amount of chemicals at just the right time to achieve consistent water chemistry.